The Motorola RAZR i packs quad-band GSM/GPRS/EDGE and quad-band 3G with HSDPA speeds up to 21Mbps and HSUPA up to 5.76Mbps. Sadly, the RAZR i lacks LTE connectivity, but that's not too big a deal as those are still hard to come by in Europe. Also, including an LTE modem would have made the smartphone costlier and when talking mid-ranger every cent count. The local wireless connectivity has Wi-Fi b/g/n and full DLNA support (both client and server, for images, videos and music) with both 2.4GHz and 5GHz band compatibility. Bluetooth is only version 2.1 but comes with A2DP and EDR. 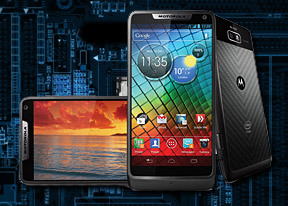 The RAZR i allows you to share all sorts of media via NFC by simply touching the devices back-to-back. You can share with other NFC devices as well, but functionality is limited to what is provided by the stock Android Beam. The Motorola RAZR i comes with the latest stock Android web browser as default, but since it runs on Android Ice Cream Sandwich, you can also install Chrome if you like. We like this approach far better than what Motorola did with the RAZR M - you are forced to use Chrome there no matter if you like it or not. Anyway, the browser's interface stays mostly out of sight, which leaves the entire screen available for displaying web content. You get the standard Menu dropdown on the right from where you can save for offline reading or request the desktop version of the website you are viewing. Sadly, Flash is seemingly a no-go on the Motorola RAZR i as we didn't even find a compatible app to try and side-load. Given that Adobe has abandoned the development of the mobile version of its Flash player, getting a version compatible with the Intel CPU inside the RAZR i seems pretty unlikely. The good news is that there are few sites remaining, where Flash support is crucial, so it shouldn't be too much of a problem. Quickoffice is an excellent app that has support for viewing several file types - Word, Excel, PowerPoint and PDF. It can also edit and create new .DOC, .XLS and .PPT files (both 2003 and 2007 versions are supported). You have plenty of formatting options, inserting images, Excel formulas and so on. The calendar has four views - Daily, Weekly, Monthly and Agenda. The app can easily handle several online calendars as well as the local calendar. You can add multiple reminders for each event and search through all events. The Clock app defaults to a desk clock mode that looks a lot like the lockscreen. The best part here is that you can tap to turn the light almost all the way down - with only the time staying on the display just bright enough to see it (it's much easier to see in the dark). This is a very power-efficient mode and you can actually use the phone as a desk clock without worrying about killing the battery. The usual alarm functionality is still present - you can set multiple alarms, each with its own repeat pattern, ringtone and label. The good old calculator is here too - it has big keys and you can swipe to the left to bring up the advanced functions (trigonometry, square root, brackets, etc.). Surprisingly, Motorola hasn't included any file manager meaning you'll have to download a third-party app from the Play Store to browse the file system of your RAZR i. Finally, there's the Smart Actions app, which comes preinstalled on most Motorola droids as of late. It allows you to create automatic actions triggered by different conditions you set. You can have the phone do various things (e.g. disable background sync, change screen brightness, display a notification to remind you of something, etc.). There are several sample actions that are useful in various situations but you can create your own from scratch too. Running on Android Ice Cream Sandwich, the Motorola RAZR i has access to almost all the latest apps in the Play Store and the ample built-in memory plus the available microSD slot guarantees you won't have trouble with space. There is a catch, though. As the Motorola RAZR i uses an X86 CPU, rather than an ARM one, it won't run any apps written using the Android NDK. Such apps will have to be rewritten to support the RAZR i Intel CPU. The good news is just about every popular app out there is either compiled using the SDK, or at least has an RAZR i-friendly version already. The Google Play Store consists of several tabs - categories, featured, top paid, top free, top grossing, top new paid, top new free and trending. Apps usually have several screenshots (some even offer a demo video) so you can get an idea of what the app looks like before installing it. You can also check out comments and ratings, as well as the number of downloads and so on, to help you decide if the app is worth it. The RAZR i has a built-in GPS receiver, which managed to get a lock in under a minute (with A-GPS switched off). If all you need is a rough idea of where you are (within 150 meters) you can use the Cell-ID and Wi-Fi network lock, which is very fast.